won't boot after logic & IO board replacement. What next? I have a wine damaged MBA mid 2012. We replaced logic board and IO board, but it still won't turn on. The magsafe charger light is orange, and does't turn green after the usual time to charge. I tried resetting MMC without change. There is no noise, no light with pressing the "on" button. Nothing else is obviously damaged inside. Attached is a photo of the logic board. It's a bit different than the 11" logicboard. I'm guessing that the two solder spots highlighted might be the debug "on switch", but wanted to confirm before attempting to short them. Two other questions: keyboard connected or not; and charger connected or not? The power pads for the 13 inch are located just above the keyboard terminal. http://www.insidemylaptop.com/images/Mac.... I would leave the keyboard and battery connected, but disconnect the charging cable. it booted up but needed the charger connected as the battery was dead. (Battery checked out ok on system check, however). I reset the SMC since it was acting a bit slow, and that worked ok, even turned on from the keyboard power button. About 10 minutes later it turned itself off. I'm charging the battery now, but it sounds like the keyboard needs to be replaced. If so, I'm looking at the $30 eBay keyboards. Any other suggestions are appreciated! Thanks. The power button worked? Hmm, do all of the keys work as well? Check to make sure you have sound as well as other basic features because the problem may be something other than the keyboard in this case. It may very well be that your keyboard is broken, as the power button is connected to the keyboard. 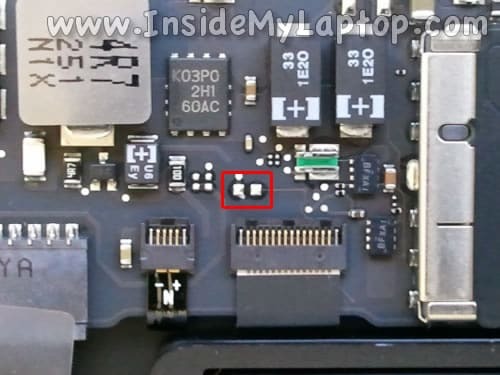 To see if this is actually the issue, locate the power pads on your logic board as seen in the accepted answer by oldturkey to this question Power on pads for Mid 2012 MacBook Air 11" A1465. Using pair of tweezers, touch both of the pads for several seconds with the battery and all other components in the machine. If you hear a startup sound and the machine turns on, then you know that the keyboard is damaged, and that is about a $30 repair, though you will want to set aside several hours and an uninterrupted workspace because it involves many tiny screws. You can find a replacement keyboard easily by searching on ebay for your model number. Hope this helps! tpschaaf 가/이 대단히 고마워 할 것입니다.